Sony AIR-S20PK review | What Hi-Fi? This isn't the first time Sony has tried its hand at wireless music systems. Its Gigajuke range didn't quite hit the mark, so now it's over to the Sony AIR-SA20PK to take up the multiroom music baton. There are three boxes in all, each of which needs mains power. A slimline iPod dock and wireless transmitter box is the most crucial component, which is joined by two wireless receiver music systems. 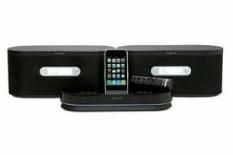 The main dock unit has a headphone connection, stereo output for connecting straight to an amplifier – giving three rooms of music alongside the receiver systems – and a composite video output for watching iPod video content on a TV. There's no hard disk or CD drive, so we're talking strictly iPod for your music. Plug in the receiver systems and instantly they sniff out our iPod's tunes. Each also boasts FM/AM tuners, though no DAB, allowing you to listen to the radio on one unit while listening to your iPod on the other. There's a remote for each box giving you full functionality on the main dock, or volume and skip track/station on the wireless systems. The receiver systems' sound is satisfactory-to-good in sub-£100 iPod dock category, but not much better than that. Bass is a little boomy, detail could be better and there's a lack of overall finesse. But there is scale and solidity, as well as a fairly even tonal balance. The Sony AIR-SA20PK remains a fine-value product, representing a simple and versatile wireless multiroom system available online for just over £200. If only sound quality was a little stronger, this would have taken all five stars.